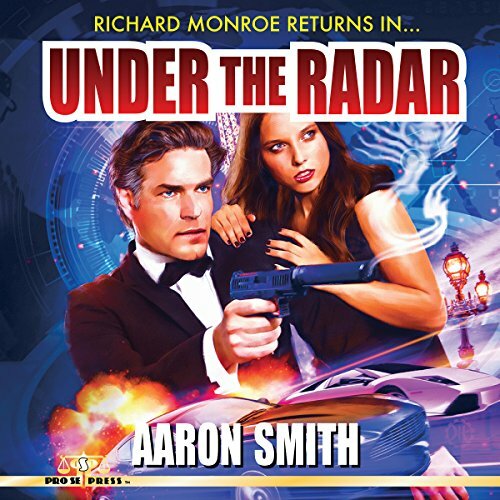 AARON SMITH’S SECOND RICHARD MONROE SPY NOVEL- UNDER THE RADAR- NOW AVAILABLE AS AUDIOBOOK! Author Aaron Smith introduced one of New Pulp’s best spies, Richard Monroe, in NOBODY DIES FOR FREE. Monroe returned again in Smith’s second novel from Pro Se Productions, UNDER THE RADAR. The latest Monroe adventure is now available as an audiobook produced by Radio Archives! IT’S NEVER AS EASY AS IT SOUNDS … American agent Richard Monroe, still working on assignments too sensitive for the official agencies, is shocked to find the President of the United States sitting in his apartment. The First Daughter has run off to seek freedom from the constraints of being the child of the world’s most powerful man. At the president’s request, Monroe is dispatched to find the young woman, a mission that soon turns into something far deadlier than it seems on the surface. Monroe is not the only man chasing Sophie Davis across the nation and, soon, across the world. Also on her trail is a religious zealot with a sinister agenda. As more and more complications arise, the simple search for a runaway turns dangerous. Monroe uncovers a conspiracy as old as the United States and, with thousands of innocent lives at stake, plays a treacherous game against the mysterious man known as The Scorpion. The thrilling sequel to NOBODY DIES FOR FREE-UNDER THE RADAR by Aaron Smith. From Pro Se Productions. http://www.amazon.com/Under-the-Radar/dp/B017Y2AU38/ref=sr_1_2?ie=UTF8&qid=1447699818&sr=8-2&keywords=under+the+radar+audio. It is also available on Audible at http://www.audible.com/pd/Mysteries-Thrillers/Under-the-Radar-Audiobook/B017Y2ATO8/ref=a_search_c4_1_3_srImg?qid=1447699771&sr=1-3. It will be available on ITunes as well. Print and digital versions of UNDER THE RADAR are also available at Amazon and other online retailers. To learn more about Pro Se Productions, go to www.prose-press.com. Like Pro Se on Facebook at www.facebook.com/ProSeProductions.For more fantastic audiobooks and more from Radio Archives, go to www.RadioArchives.com. JOSHUA REYNOLDS’ ‘RED SHAMBHALA-THE NEW ADVENTURES OF JIM ANTHONY SUPER-DETECTIVE VOLUME TWO NOW AVAILABLE AS AUDIOBOOK! PULP AUTHOR CHARLES BOECKMAN’S ‘SNATCHED!’ NOW AVAILABLE AS AUDIOBOOK!